It’s one of the weirdest custody battles I’ve ever read about, and it’s not even over a living person. It’s not over a dead person, either. 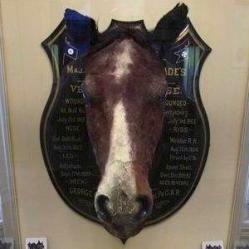 It’s the stuffed, preserved head of a horse. Old Baldy, a horse, was the pride of General George Meade, a hero of the Union Army during the Civil War. He won the Battle of Gettysburg astride Old Baldy and when Baldy passed on, two Union soldiers dug him up, decapitated him, and sent his head to the taxidermist. The headed ended up at the Civil War and Underground Railroad Museum in Philadelphia. When the museum closed, the head ended up at the Grand Army of the Republic Museum. Since then, the two museums have fought over stuffed head of Old Baldy until courts finally arranged a custody agreement. The head is expected to arrive back at the Grand Army museum this month; the Civil War Museum is currently scheduled to reopen in 2015. Old Baldy is expected to remain dead for the foreseeable future.